Baby got back from Fantasycon in Chester, very happy to have mingled with old friends and new. Here is Baby’s account, as written up by Heide. Baby and I arrived in Chester just after 3pm on Friday afternoon. Friday was our busy day, so I went to the bar to look for the other people on the Hysterical Fiction panel. I found Richard Webb and Justin Lee Anderson without too much trouble and we got to the panel room for the 4:30 panel and met Duncan P Bradshaw. Richard had given us some homework, and so we each read a brief passage from a funny book and commented on it. Justin read from Good Omens, which is such a classic that you could dissect it for hours on end, but Justin pointed out some of the sentence level techniques. Duncan read from Larry by Adam Millard, commenting on the wildness (and the similarity to his own family). I read a piece from Second Coming by John Niven, which sets out the stall for the reader, so that they can anticipate all of the fun stuff that is going to happen in the rest of the novel. There was lots of great discussion and the audience asked some really interesting questions. Justin and I were also doing a reading soon afterwards, so I went down to the restaurant, to ask if I could borrow a high chair for Baby. I didn’t exactly lie to them, but I didn’t correct them when they wrongly assumed that I was a guest in the hotel and I planned to feed a real baby in my room. The third person in our reading slot was Iain, so I was keeping tabs on how close to Chester he was, as Justin and I would read a long piece or a short piece, depending on whether he was likely to make it in time. I read a story containing a protagonist whose actions are influenced by a creepy baby doll. People sometimes want to know where writers get ideas from, but it’s very tricky to pin down where some of these things come from. 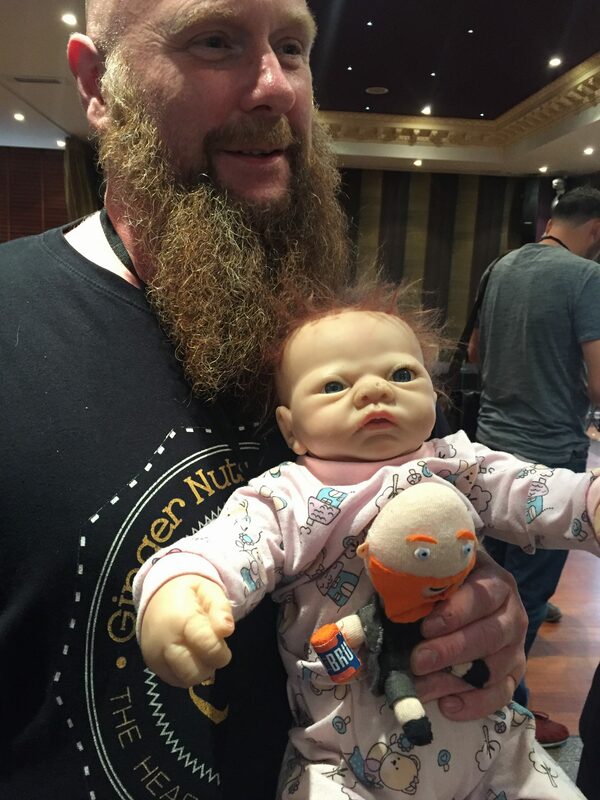 I mean, who would go round with a creepy doll in real life? As it happened, Iain made it exactly in time to do his reading, entering the room with a dramatic flourish and then reading an extract from the new Clovenhoof’s Diary. 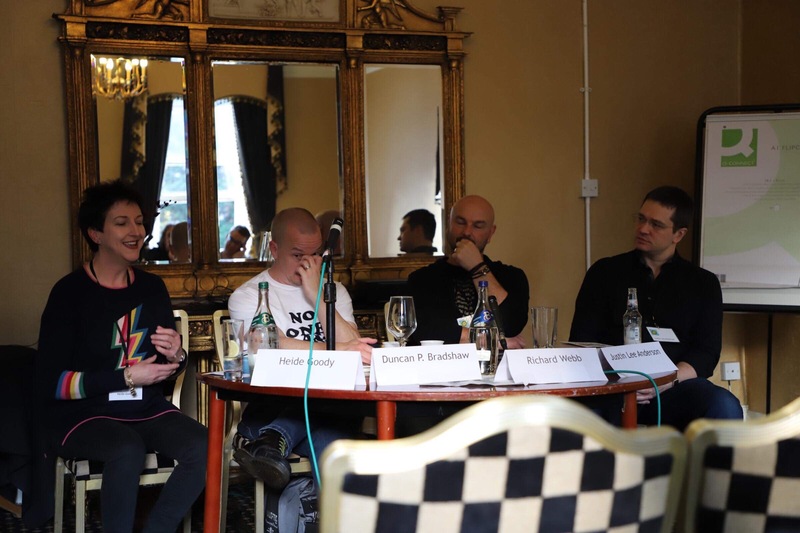 We had a short gap to inhale some chips in the bar and then it was time to moderate the Self Publishing panel. We had an interesting range of experience on the panel. 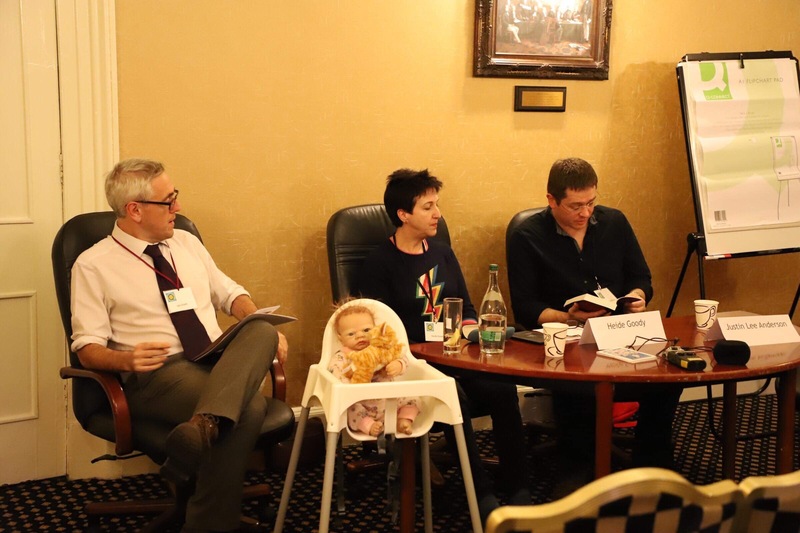 Steve McHugh had moved from self publishing to traditional publishing, Ritchie Valentine Smith and Rachel McLean are early on in their journey and Iain and I have self published since 2012. Because of this, it was a very practical panel, with lots of hints, tips and ideas about where money needs to be spent. Iain and I ran a workshop in the morning called “Fractal Writing”. It’s a very condensed version of the plot and story workshop that we sometimes run, with the added bonus of having a tactile element to it, because all participants make a piece of garish artwork so that they can break down their plot onto the stuck-on shapes and use it as an aide-memoir or just to explore the plot in a more visual way. The redcoats were very helpful when we got to the room and there were no tables laid out, and it was soon sorted. It’s a challenge for ten people to each work on a giant piece of paper, even with plenty of table space, but everyone showed great resourcefulness in using other surfaces and the workshop was great fun. 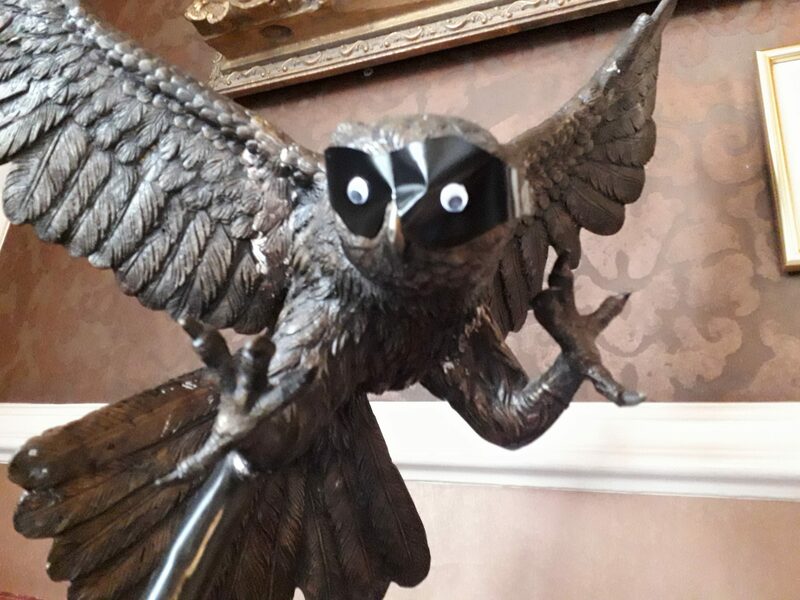 The stationery box that we carried back down from the workshop included a pack of googly eyes, so the conversation inevitably turned to the story of the city of Savannah where officials warned against people defacing statues with googly eyes. Imagine our surprise when we noticed that the owl next to us had a Zorro mask with googly eyes on it. 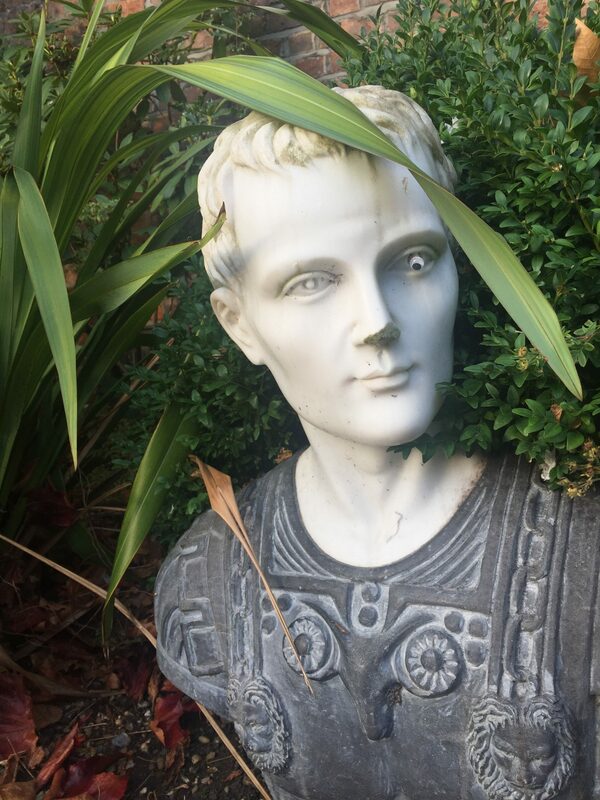 A statue in the garden had a googly eye wink going on, but Baby denied any involvement. 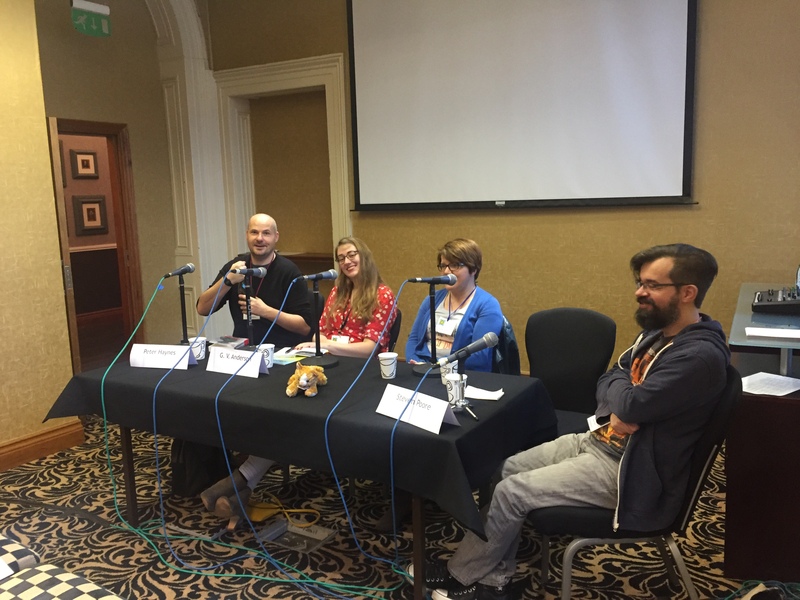 Next up was Iain moderating the Religion in Genre Fiction panel. 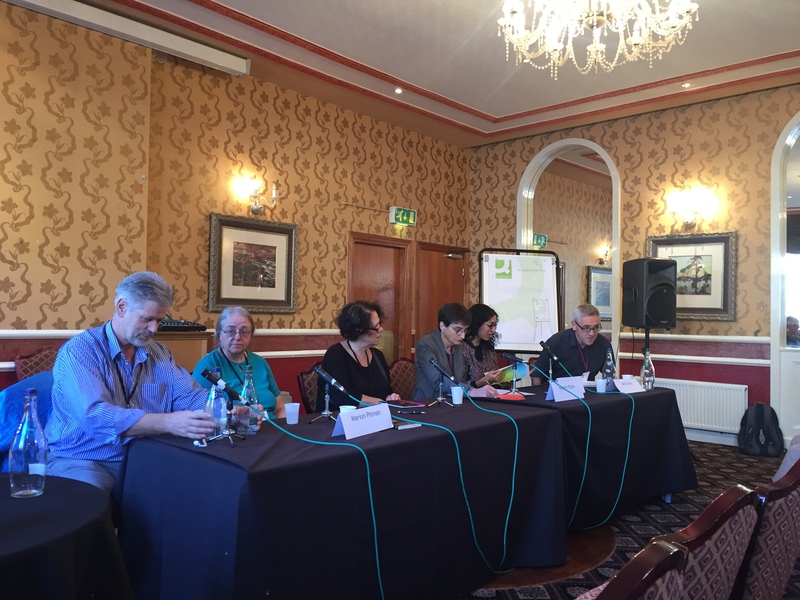 This was a very popular panel, and the panellists did a great job of exploring a huge topic. 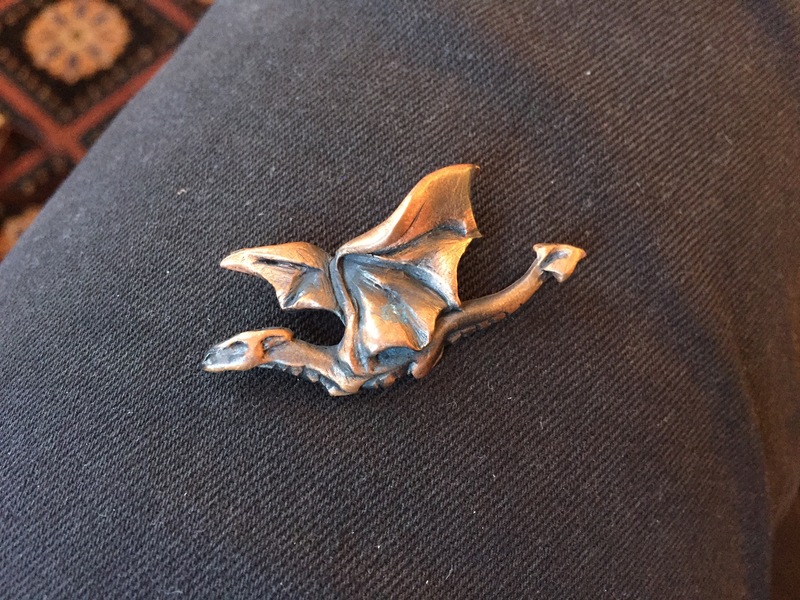 While I was paying close attention to the discussion I found a tiny dragon on the floor. It kept very still when I picked it up and posted on the Fantasycon Facebook page. I passed it to the registration desk and happily it was reunited with its handler later in the day. On my way to the Alchemy press launch I bumped into Jen Williams and Anna Smith Spark. 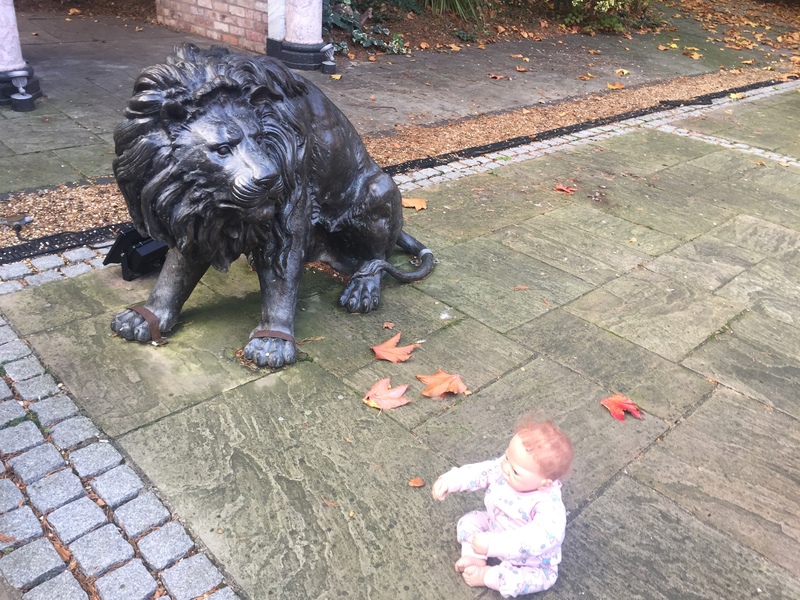 Jen had a cuddle with Baby, which was almost certainly how she came to win the best fantasy novel in the BFS awards the next day; nothing to do with it being a great novel or anything. 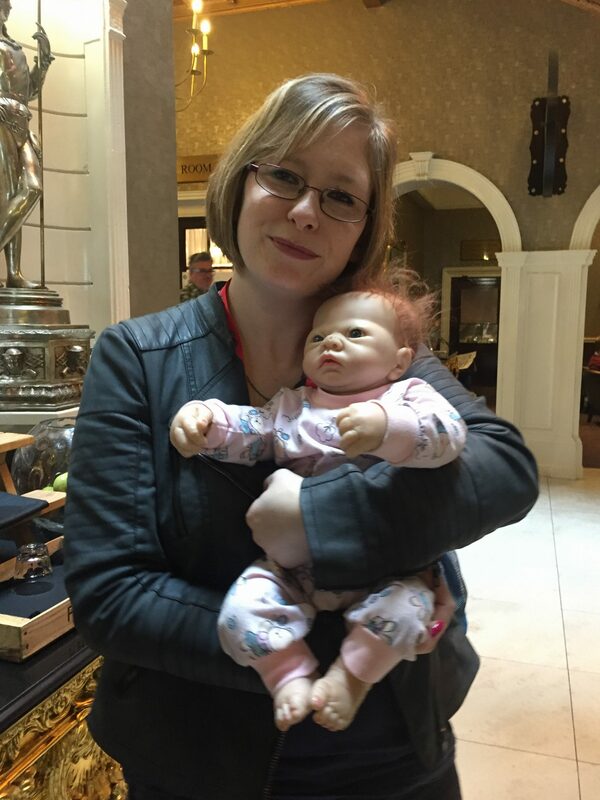 Jen Williams cuddles Baby. Probably as great as winning best fantasy novel. Probably. 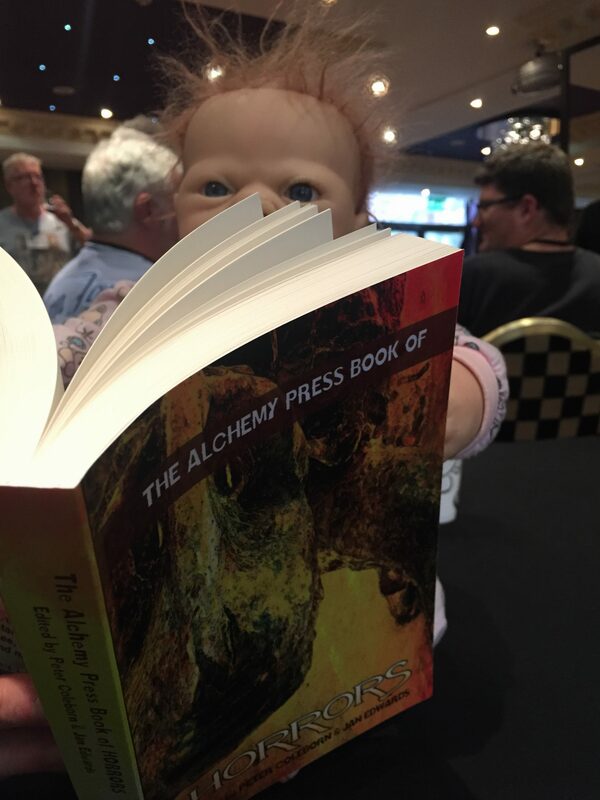 Baby dug straight into the stories once we’d bought a copy of the Alchemy Press book of Horrors and it had emerged from the spin cycle of the authors all sitting in a circle, signing books until they got dizzy. Rio Youers suggested that Baby was related to Jim McLeod. He might have a point. 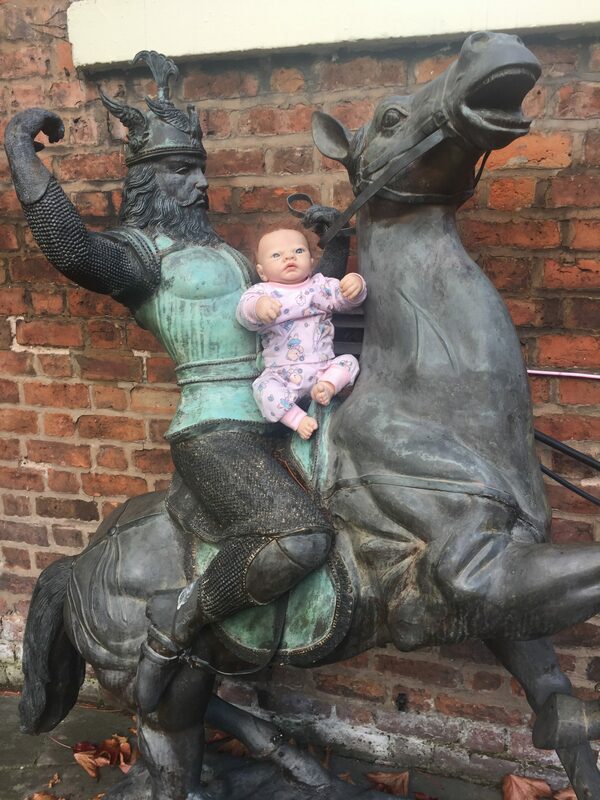 Baby was left behind when we went out for an actual meal, which was fabulous after just inhaling snacks in passing for previous meals. We went to Istanbul, a Turkish restaurant, and had some amazing mezze. When we got back it was time for a late night panel. 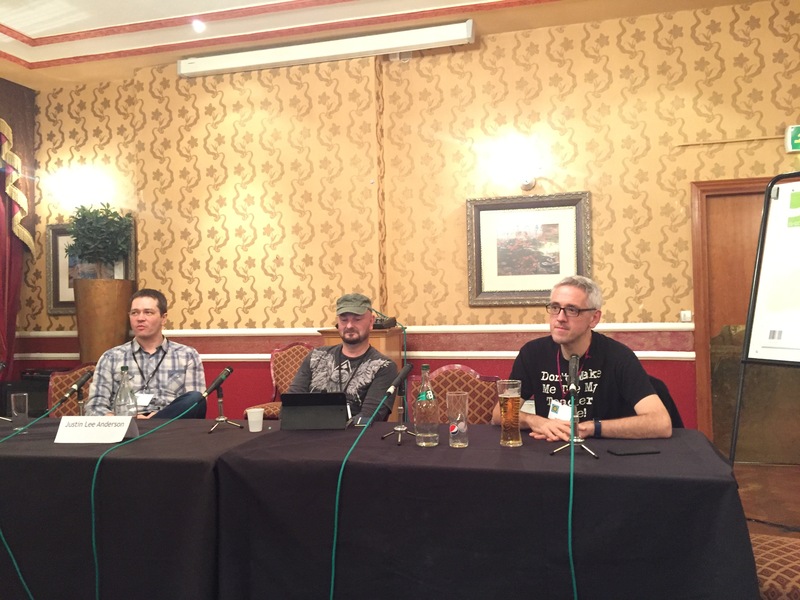 Iain, Justin Lee Anderson and Richard Webb were discussing Film Comedies in Fantasy, Horror and Science Fiction. It was a fascinating and lively discussion and I strenuously deny the cruel allegation that I fell asleep in the middle of it. I was just resting my eyes. 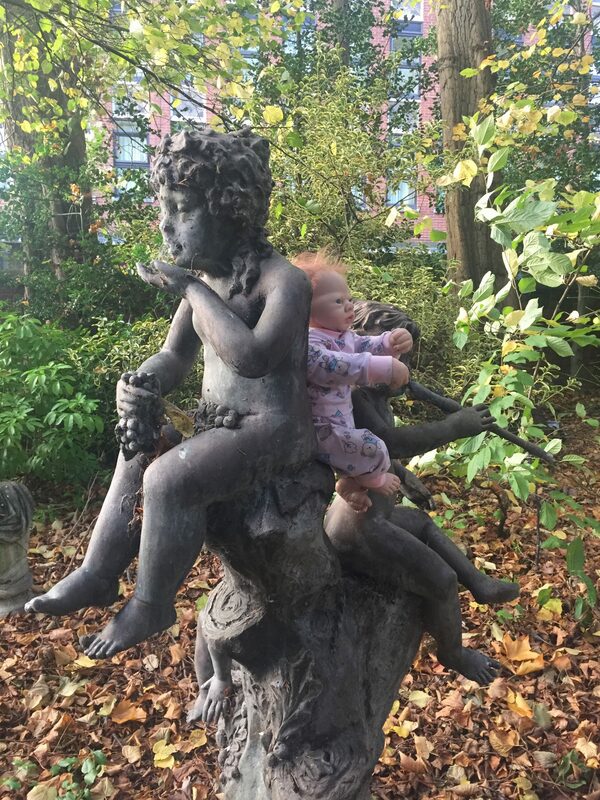 Sunday morning was time for a stroll amongst the bizarre statues in the hotel’s garden. More than one person stopped in the adjacent corridor to bang on the glass and indicate that I should be locked up for my own safety. 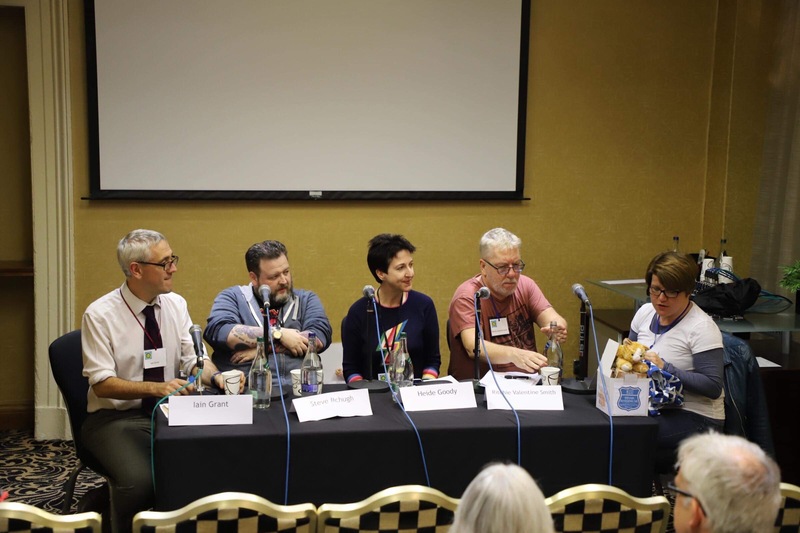 Then it was time for the panel on Starting Out Writing Genre Fiction with Steven Poore, Rachel McLean, G V Anderson, Peter Haynes and Tasha Suri. This was an engaging discussion about how the panellists had found their various paths into publishing, with lots of audience questions. Baby sensed that it was almost time to go home, and was determined not to be put back in the tote bag. 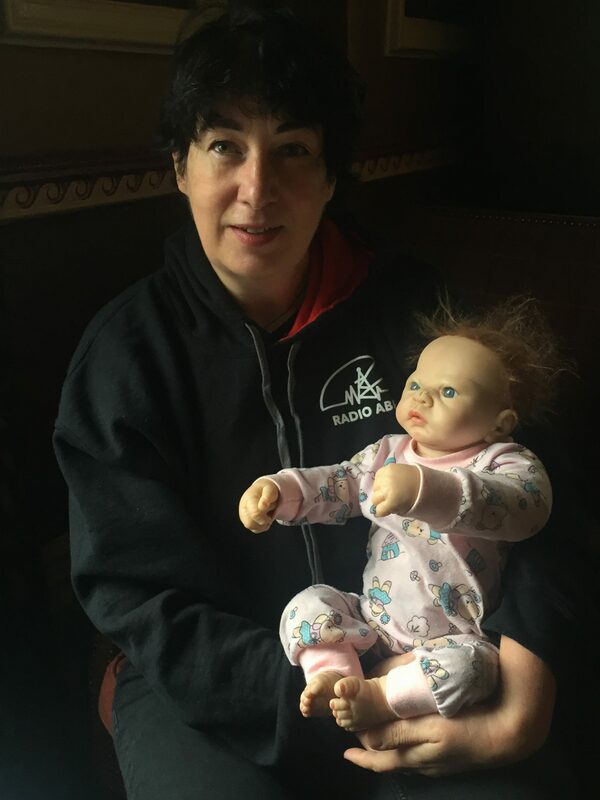 Joanne Harris was kind enough to agree to have a picture taken and now I think she will have to put this on the back of her next book, because the “classic pose with creepy doll” is very much in fashion amongst BFS award winners. 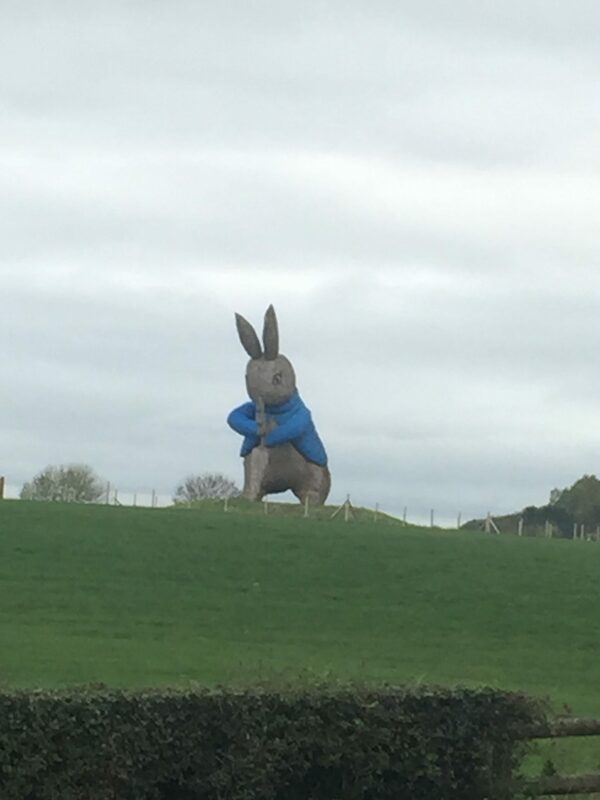 Had we seen the last of mad creepy statues as we drove away from Chester? We thought so, until we saw this and had to stop the car to stare at it properly.